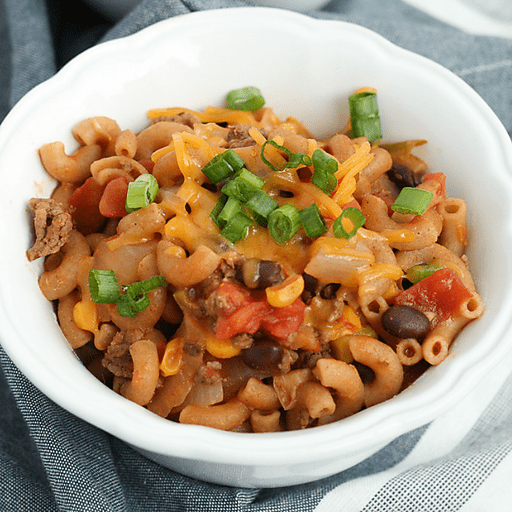 This One Pot Taco Pasta combines all of our favorite things - simple preparation, easy clean-up and loads of flavor! Swap out the ground turkey/beef blend for a different ground meat, or add in your own special ingredients. We know this recipe will be a new family favorite! 1. Heat a large stockpot or Dutch oven over medium-high heat. Add ground turkey/beef blend, onion and garlic. Cook until meat has browned, about 3-5 minutes. Drain excess fat. 1. Stir in corn, black beans and green chiles until well combined. Stir in tomatoes, taco sauce, salsa, pasta and 4 cups water. Bring to a boil, cover, reduce heat and simmer until pasta is cooked through, about 13-16 minutes. 1. Remove from heat and garnish with shredded cheddar and green onions. Serve immediately. For gluten free: Use gluten free macaroni in place of whole wheat elbow macaroni. Calories 480, Total Fat 11g (Saturated 4.5g, Trans 0g), Cholesterol 50mg, Sodium 520mg, Total Carbohydrate 7g (Dietary Fiber 10g, Sugars 9g), Protein 29g, Vitamin A 8%, Vitamin C 10%, Calcium 20%, Iron 25% *Nutritional values are an approximation. Actual nutritional values may vary due to preparation techniques, variations related to suppliers, regional and seasonal differences, or rounding.